Food is really taken to the next level when fresh herbs are used; however, it can be a pain chopping them all up, especially when there are a few different types needed for one meal. With the Jenaluca Herb Scissors, mincing up those leaves is now effortless and takes no time at all. Take a shot at fermenting your own fruits or vegetables with this at home DIY Mason Jar Fermentation Kit. On the side of the box, it even tells you which spices go with which, to create deliciously tangy and probiotic-rich accompaniments to sandwiches, meals, salads and more. No burger from the store will ever taste as good as a quality homemade burger, though this neat little device also makes crabcakes, sausage patties for the best breakfasts, and even stuffed burgers – so you can fill them with whatever cheese you feel like from cheddar to gooey mozzarella. Feel like a professional cocktail maker with the Mojito Muddler – this handy gadget gets to all of those last pieces of fruit and pesky herbs which stick to the bottom. The mojito muddler is made from sustainable, and seriously durable, bamboo which is naturally antibacterial, and it also comes with lifetime warranty. For those with a large, luxurious collection of fine wines – while they may long to taste those amazing rich flavors, they won’t want to ruin the corks and waste the rest of the glorious wine inside. Combatting this frustrating problem is the impressive Coravin Wine Preservation System, here to save the day. Sometimes you just need a little avocado, for toast, tacos, or just as a healthy snack, which means most of the time you still have half left, a half which goes off quickly and ends up in the trash. Not anymore, because these awesome Avocado Huggers embrace them securely to keep them fresh. A true grilling chef needs only the best cooking tools, and that’s why those old redundant bamboo skewers need to be thrown out and replaced with these Grillaholics stainless steel skewers. Gone are the days of unevenly cooked kabobs, now those hours of marinating and preparing will be worth it. Nothing says authentic Italian cooking like fresh, handmade ravioli – while that may throw you off as it sounds a little difficult, don’t you worry as this Homemade Mushroom Ravioli Kit takes away all of the hard work, and the simple instructions make it seriously easy to impress your friends and family. Keep your herbs at ultimate freshness levels with the Prepara Herb Savor – this cool little thing keeps your oregano, cilantro, mint, basil and more, crisp and delicious for 3 whole weeks. Not only that but it also prevents them from getting crushed and damaged by other items in the fridge. For the healthy inclined, this 3-blade Spiralizer is the ultimate kitchen essential, for sure. There are two blades which turn any vegetable of your choice into spirals (noodles) of different thicknesses for pasta replacement, and the other blade cuts them into thin ribbons – great for salads or even amazing homemade coleslaws. This father’s day gift idea takes away all of the hassle (and smelly fingers) from preparing garlic – a totally essential ingredient, for a variety of dishes and marinades. Place the garlic cloves into the peeler tube, roll it back and forth and like magic, they’re all peeled ready to crush with the rocker. The Chef’n Cob Corn Stripper is a handy item that makes prepping tasty summer salads, salsas, and meals, super easy and effortless. Just insert it over the cob, twist and push it down, and it strips the corn ready to be used however you like. Who said cooking has to be a chore? Well, even for those who aren’t too fond of the kitchen, this useful tool definitely makes it a bit easier for them and may even coax them into enjoying it a little. The Kale and Herb Razor ensure making kale crisps, or even smoothies, simple and quick. Whether you’re rustling up a quick grilled cheese, veggie burger, quesadilla or you’re grilling a vegetable side dish, the Soapstone Cooking Press is the ultra-versatile piece of equipment that every home cook needs. Its natural thermal properties mean you just need to heat it up in a pan and it’ll be ready to use. We all wish we had an extra pair of hands when cooking up a storm in the kitchen, though unfortunately, those aren’t available to purchase just yet (even in this day and age) but the Jokari Storage Bag Holder does help out a tonne when needing to pour purees, sauces, and other foods into bags. No real foodie can go without a trusty thermometer, especially when baking tasty delights, or frying up a delicious steak. Save yourself the embarrassment of overdone (or even worse, underdone) sausages without having to slice them open in full view of your barbecue guests to check if they’re still pink inside with this handy digital gadget. Bring some fun and laughs to otherwise mundane kitchens with the Al Dente Kitchen Helpers. Whether your dad is Italian, loves pasta or can just appreciate funny novelty items, he’s bound to enjoy them for Father’s Day. Included is a huge ravioli spoon rest, ribbons of mafaldine to keep things tied together, and more. While store-bought tortillas are quick, cheap, and convenient, there’s no way they compare to the homemade kind – they just don’t have the same crispy edges and irresistible taste, or the feel of home, either. This set keeps taco-night as authentic as possible (while also impressing that special someone). Shaped just like the milk bottles your mom use to get delivered to the door, the Baker’s Stackable Measuring Cups definitely give a lovely sense of nostalgia to the countertops. There’s no longer a foil lid, however, instead it’s a fun flour shaker, which sits proudly on top of the 3 sizes of measuring cups. Of course, safety is the most important thing when cooking, and these Chefaith Silicone Kitchen Gloves ensure your hands are protected from everything hot. These are super flexible gloves that are easy to put on, and seriously durable, lasting over 1,000 uses, making a great Father’s Day gift this year. Fresh seafood is certainly delicious, sometimes the whole effort of ensuring every bone is taken out, and the fussing around descaling them can put you off cooking fish at all, but with this handy Fish Scaler, the work is done for you. Not only does it make preparation super easy, it’s less messy, too. If he loves sushi, he’s sure to appreciate this Sushi Roller Kit – it takes away the complicated art of making sushi and instead makes a fun to make meal that’s also nice and quick. His friends and family will definitely be impressed with his new delicious sushi-making skills. It can be a bore, peeling, de-coring, and chopping up fruits, especially pesky pineapples, but with this ultra nifty tool all you have to do is slice off the top, twist the pineapple de-corer into the fruit and voila – it’s instantly ready to enjoy, for a juicy fruit salad or on its own. Put a traditional spin into the kitchen with this Butter Churner – it even looks a little old-fashioned, but don’t worry as it’s seriously simple to use. Spread a little happiness by making use of the recipes that come included to make super scrummy flavored butters that are bound to impress every hungry guest. The Snap ‘N’ Strain strainer from Kitchen Gizmo is the seriously convenient device that’s designed to clip on to and fit pots, pans and bowls whatever their size, even if they have a lip. Gone are the days of having to have a whole selection of strainers clogging up your cupboards. Ensuring you get all your necessary vitamins, minerals, and healthy fats, but not too much salt, each day is certainly tricky, so there’s no wonder why it can sometimes become confusing (especially for those less health-fad savvy). The Iron-Infused Cooking Fish is here to help out, making sure you get your much needed iron intake. Created by Brian Kunkelman, these handmade Soup and Cracker Bowls are here to revolutionize how you eat your soup and crunchy companions. You no longer have to worry about tipping your soup as you reach for your crackers, though this bowl could also be used for chili, or hummus and yummy dipping veggies. The same healthy snack as made on the stovetop, instead just with the convenience of the microwave; the Popcorn Popper is a quick way of getting your popcorn ready for a marathon of your favorite movies. You can even place a knob of butter on top for it to melt at the same time, too. Dads are king of the grill, we know that, but are they a pro at making stuffed burgers? Well, even if they weren’t, they will be now with the Grillaholics Stuffed Burger Press. Not only does it enable him to make the most delicious burgers, but there’s a recipe book too for more tasty ideas. The Good Cook Manual Juicer System is the most efficient way of making fresh juice for your recipes, whether it’s lemons, limes, oranges or even grapefruit. On the side of the juicer are measurements so you can see just how much you need to make. It also has a helpful non-slip base. Slice, dice, core, cut and serve with this genius kitchen tool: the Oaklyn’s Watermelon Slicer. You really can do it all with the slicer; it’s curved for safe and convenient watermelon slicing but not only that, it also doubles up as tongs to pick up and serve those juicy melon slices, yum! Cherries make a great healthy snack, especially for dads who’re always on the go as they’re easy to eat, although no one enjoys having to chew around the stone. The OXO Good Grips makes a great Father’s Day gift as it pits for you, so Dad can just get on with his snacking, undisturbed. Breakfast and meal times can be a challenge, especially if there’s a few fussy kids thrown into the mix. 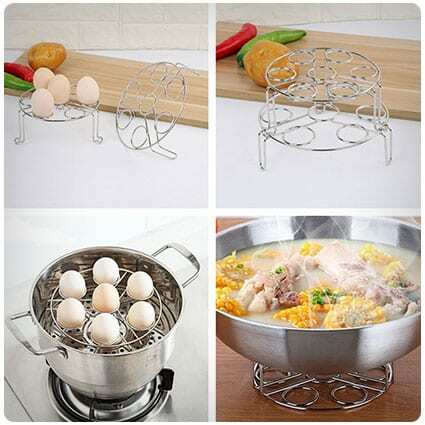 We all know one thing you can’t go wrong with, though, and that’s boiled eggs and toast which just couldn’t be easier with this Egg Steamer Rack which holds up to 14 eggs. Simply push and twist brussel sprouts into the Chef’n Twist Prep Tool to easily remove the stem and dense core, leaving them ready to cook however you wish. It also helps to loosen the leaves for even cooking, whether you choose to broil, roast or fry them (though they do taste delicious fried with bacon). Every cook and kitchen needs their essential tools and gadgets, and this sturdy metal bowled Zulay Citrus Press needs to be one of them. Not only does it juice your lemons and limes (guaranteed to get more juice than other juicers) there will be no horrible seeds, either. Garlic is essential for so many foods, from everyone’s favorite side dish, garlic bread, to adding flavor to chili, ragu and so much more. Being in so many recipes, the constant peeling and dicing can become a bit tedious (not to mention smelly, so use these tools instead and prepping garlic will only take seconds. There’s absolutely no way anyone can go without this utterly genius gadget in their kitchen. It’s a great way of getting everyone to join in (whether they enjoy cooking or not) as it literally does all the hard bits for you, like chopping and dicing all vegetables whether small or large, and even spiralizing. Make grilled cheese, paninis, quesadillas and so much more, quick as a flash with the Chef Buddy Panini Press. It’s not only good for cheesy snacks, though, as it also folds out flat for a convenient indoor non-stick grill so you don’t have to wait for good weather to make gorgeous burgers and steaks. If your pa’s a gym junkie who uses protein shakes, or he’s a guy who likes to take care of his health, why not get him this awesome Portable Blender by Joozfresh? The heavy-duty, stainless steel blades will whip up your juice, shake or smoothie in under 2 seconds, no matter where you are. Make breakfast in a flash with this cool Breakfast Sandwich Maker. There’s no need to stand around the stove while cooking your eggs and ham, instead place your ingredients of choice into the sandwich maker and it’ll rustle it all up for you, and even has a timer to let you know when it’s done. This set of 3 Herb Savor Pods keeps your delicate herbs fresher for much longer, meaning you have nice crisp herbs at the ready for whatever meal you’re cooking up. The pods keep in the fridge door, all you have to do is pour in some water every 3-5 days – effortless, right? Himalayan Salt is certainly a superfood; it contains all 84 elements found in our bodies. It’s also known to balance blood sugar and regulate water content, so there’s no wonder why it’s become popular. With this Father’s Day gift, you can rest assured you’ll not only be flavoring his food but offering health benefits too. This nifty little invention allows you to just twist the spritzer cap into your fruit of choice, so you can use its juices in no time at all, and without any nasty added ingredients. The set comes with 2 sizes, one for smaller fruits like limes and a bigger one for grapefruits and oranges, etc. Of course, you can go to the store to buy guacamole, but it’s never as good as the homemade kind (and you won’t have the satisfaction, either). Plus what dad doesn’t enjoy playing chef and using fancy kitchen tools? The Guacamole Utensil Kit comes with everything he’ll need to whip up a delicious batch. He’s bound to feel like the ultimate meat master with the Grillaholics Meat Claws, and can you blame him? They’re pretty impressive. They’ll show any tender and juicy joint of meat who’s boss, as he shreds it up with ease ready to make pulled pork sliders and other yummy delights. 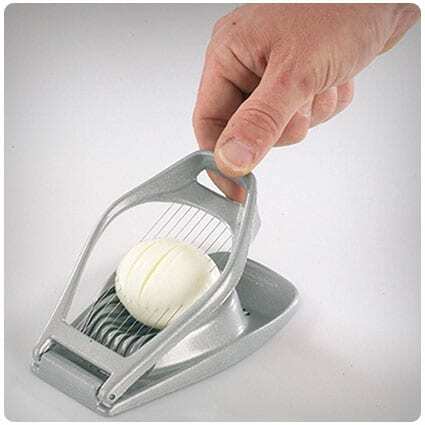 Whip up a tasty eggy snack in no time with this useful stainless steel wire egg slicer. It slices boiled eggs perfectly, ready for a tasty sandwich, salad or yummy egg mayonnaise. The slicer also manages other foods, such as kiwi, mushrooms, strawberries and more – isn’t that eggciting? The Prepara Cookbook Holder props up your book and keeps it open as you follow the recipe, so no need for you to constantly have to find the right page while getting it covered in cake batter and sauces at the same time. It even has a handy splash guard to protect books and devices. Making around 16 utterly delicious tamales, this DIY Tamale Kit is bound to be a winning gift for those who enjoy a touch of spice in their foods. The kit even comes with corn husks, ensuring they’ll be cooked the authentic way – just like they should be in the traditional Mexican holiday, Tamalada. Why trawl through recipe books when you’re sure to find the recipe online, which, let’s face it, is much easier and faster. But what happens once you’ve found your recipe? Well, that’s where the Tablet Holding Cutting Board comes in, meaning you can read and chop at the same time. No muss, no fuss. Knife blocks are so last year, so bring your pa up to par and show him the modern way, by displaying his knives on the wall – he will have more than enough reason to with these gorgeous, colorful knives that anyone would be proud of. This set even comes with its own knife sharpener, too. We’ve all been there, mid-way through your delicious egg salad that you had previously made that morning to find that you hadn’t shelled the egg as well as you had thought. Well don’t you worry, with this Easy Egg Peeler, you will no longer have those annoying little mishaps, as the shell comes right off. Rotate your way to ultimate cheesy victory with the Loyalmaster Rotary Grater. The handle is easy to use, making it great for those who aren’t quite as strong as they used to be, while the 3 interchangeable drums are simple to switch over. It looks ‘grate’ too, making it a brilliant Father’s Day gift. Pair this gorgeous Handmade BBQ Sauce Pack with a pair of super manly meat claws or a BBQ utensil set for a brilliant, thoughtful gift for your barbecuing king. Pour the amazing spice mix recipe into a mason jar, ready to package up however you like or use the cool ideas on this blog. If your dad already has everything, and you’ve exhausted the option of funky socks, then try out these neat Father’s Day Sampler Boxes. You can cater the box to whatever your dad’s tastes may be, whether it’s cookies, cakes, fruits or even tea – display it nicely, print out matching labels and you’re good to go. Surprise him with this DIY Popcorn Sampler; if he’s a fan of trying new foods he’s bound to enjoy this thoughtful gift idea. For under $50 you can create a unique gift he’s sure to never have had before – which is great as he’s probably getting bored of the usual card and crate of beer. We all want to show our dads how much we appreciate them on this day all about celebrating him – naturally you’re on the hunt for the perfect gift that he’lll adore, so take a look through this list of amazing father’s day gifts. From high tech gadgets to futuristic marvels, you will find something on this list to amaze every techie dad who is into fitness. If you are looking for great Father’s Day gifts, you will find the perfect choice here. Finding it difficult to get a heartfelt Fathers day gift? If so, check out this comprehensive list of personalized and alternative presents which speak more to the heart of a father than to the money in your wallet. Some dads are just awkward to buy for, and for those fathers you need a list of uncommon Father’s Day gifts which will show you items that are slightly off the wall and appealing to unusual minds. Father’s Day is around the corner and if this is your husband’s first Father’s Day, you’ll want to make a fuss of him. We’ve collected some of the must have gifts for new dads and put them together in a list for you. Just pick a present or two for him and he’ll be the happiest Dad on the planet. Some Dad’s just love all things science and nerdy, which makes them extremely difficult to buy for. Fear not though, we’ve rounded up some of the geekiest Father’s Day gits around so all you have to do is choose a couple to give your ol’ Pops this year.